This classic & delicious recipe for Italian basil pesto is different in that I use walnuts instead of more traditional pine nuts. One of my favorite things about summer cooking is stepping out my back door to pick fresh herbs from my vegetable garden. It always amazes me how the tiny seedlings I impatiently wait for to sprout in May grow into more herbs than I can possibly use up in August. This is a classic recipe for Italian basil pesto. The only difference is that I use walnuts instead of more traditional pine nuts. 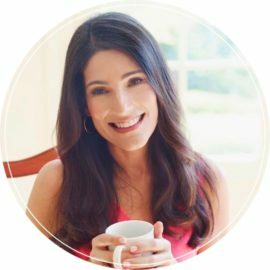 This is because in recent years an increasing number of people (including myself) have fallen prey to a bizarre problem with pine nuts called Pine Mouth Syndrome — a bitter, metallic taste in the mouth that develops a day or two after eating pine nuts. It can last for weeks and make eating or drinking anything very unpleasant. Several food writers have written about it, and since it also happened to me, I thought it was worth mentioning. There is some evidence that the suspect nuts come from China but no one knows for sure. In any case, I’ve sworn off pine nuts for a while. To begin, combine the walnuts and garlic in the bowl of a food processor and pulse until coarsely chopped. Add the basil leaves, salt and pepper. Then, with the food processor running, add the olive oil through the feed tube in a steady stream. Be sure to use good quality olive oil; it makes a big difference. Add the Parmesan cheese and process again. That’s your pesto! Try it on pasta, potatoes, grilled meats, sliced tomatoes, fresh mozzarella, or vegetable soup (coming soon!). Place the walnuts and garlic in the bowl of a food processor fitted with a steel blade. Process until coarsely chopped, about 10 seconds. Add the basil leaves, salt, and pepper and process until mixture resembles a paste, about 1 minute. With the processor running, slowly pour the olive oil through the feed tube and process until the pesto is thoroughly blended. Add the Parmesan and process a minute more. Use pesto immediately or store in a tightly sealed jar or air-tight plastic container, covered with a thin layer of olive oil (this seals out the air and prevents the pesto from oxidizing, which would turn it an ugly brown color). It will keep in the refrigerator for about a week. Freezer-Friendly Instructions: Pesto can be frozen in an airtight container for up to 6 months. You can also divide your prepared pesto into the compartments of an ice cube tray and freeze. Once it’s frozen, remove the pesto cubes from the tray and put a sealable plastic bag or airtight container. You can add the defrosted pesto cubes to soups, pasta dishes, eggs, sandwiches, and potatoes. Hi Once Upon a chef your Pizza is the best, question do you roast your walnuts for this pesto? I mention this as I got a little bit of metallic taste on the roof of my mouth or could this be something else? Hi Sue, Did you by chance make the pesto in a blender? We made this pesto tonight. Since it’s still early spring, my windowsill basil could only offer me 1 cup of leaves. I made up the balance with spinach and it was still great! We appreciated the walnuts instead of pinenuts. We have had trouble sourcing pinenuts without peanut traces (a problem for our house). Thanks for the recipe! I doubled this recipe and came out not thick enough. Flavor not tested yet, but something in the quantities not right when doubled. Hi Peg, sorry you had a problem with doubling this. Is there any chance you could have made a measuring error? I made this and it was so amazingly good. I keep it in a small mason jar in the fridge and its ready anytime for a quick stir into pasta, veggies, a dallop in my power bowl, or just a little extra seasoning in sauces or as a condiment on sandwiches. Makes me want to try versions of pesto with maybe sundried tomatoes instead of basil, or roasted peppers. I love this! 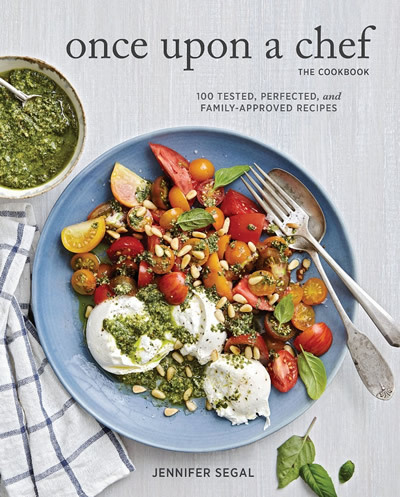 I generally feel like all pesto recipes are generally the same. Pesto is pesto after all. But this recipe is diffeeent. I can’t quite put my finger in it but every time I bring this pesto to a potluck, I get compliments on it. It also freezes well with a little extra oil and doesn’t turn brown/oxidize, so bonus points for that! I have been meaning to write this review all summer, each time I make this pesto. I had never made pesto before and this recipe is both simple and delicious! It takes minutes to throw together and tastes wonderful on pasta and chicken. Thanks for another keeper!! I’ve been making Basil Pesto for years, BUT this recipe makes the very BEST Pesto. I love it on my breakfast sandwich of English muffin, pesto, scrambled egg and roasted bell pepper. This recipe is how I discovered once upon a chef! It’s my go to pesto recipe. I like the tip about freezing the pesto without adding the cheese. I keep half in the refrigerator and half in the freezer and it never turns brown. Made this last night to throw on some pasta (I did farfalle with tomatoes and chicken). My husband told me it’s the best thing I’ve ever made. So easy and delicious! The bitterness some people have experienced is the garlic. I’ve made this with sharp garlic and milder garlic. My first time screamed “bitter,” but I knew at once what happened. I bought fresher garlic. Delicious. I add just a dash of lemon for some freshness. I had extra basil from another recipe so gave this a try. I put it on chicken breasts and baked them-so good the walnuts worked very well. I stole an idea from your shrimp and feta recipe and added cherry tomatoes for the last 20 minutes and it worked quite well. We enjoyed the chicken leftovers on salad! I loved this recipe, so easy and so delicious…. I have loads of basic and needed a good pesto recipe. I make it every week until my basil freezes.. ): I’m going to make your Pesto Shrimp tonight, will let you know later about it. Loved this I used pecans instead of walnuts. It was delicious. Just another option if Walnuts are too bitter for you. I’m glad I found your sites. It’s beautiful and the other recipes look amazing. Hope to try another one soon. In regards to the metallic taste in your mouth after eating pine nuts from china: if they are toasted first there should not be that taste. A friend of mine is a specialty food sales rep for a spice and nut company and that is what she told me. I find it does work. I bought a nice Walnut Olive Oil at a specialty store and have been looking for a recipe to use it in. I’d probably roast the walnuts first to give them a little more nuttiness. What do y’all think about using that oil? Maybe I could put the parmesan cheeese in before the oil and then just make up a tiny bit with the special oil….check taste before adding to the entire batch. I think that sounds like a good way to go, Jeanne. I’d love to hear how it turns out! This is my go to spot for recipes, I’ve always been so pleased with how everything turned out until now. I know it’s not the recipe but rather my ingredients, however, this was inedibly bitter, went right in the garbage. Not sure what caused the bitterness? I’d like to try again, perhaps someone could shed light on what could have caused the bitterness and if there is any ingredient that could fix it in case it happens again? Sorry to hear you had a problem with this Julie! It definitely should not taste bitter– Any chance the nuts could have been spoiled or burnt? Also, you used walnuts (and not pine nuts)? Hi Jen! No, I used brand new walnuts that tasted good. I’ll try again. Thank you for responding, so kind of you. I looove your site and recipes and I know this one is no exception. I am so looking forward to your cookbook next spring. Happy 4th! Hi there, Jenn’s pesto recipe is my go to. I have made it a few times without a problem, however I ran into an issue with the bitterness the last time I made it. My issue was the olive oil, as I found. I learned that by adding 1/4 cup of water or less, just enough to make a paste, while the ingredients (NOT the olive oil) are in the food processor stage. Once you get the ingredients to a paste like consistency, put the pesto in a bowl and mix in by hand the olive oil! This worked for me, I hope it solves the problem for you. Some olive oils are bitter. I would taste everything before you put it in, just in case. hi Jenn, Love pesto and excited to try your recipe. Question for you – have you tried pistachios? I read this is the sicilian version. Debating them or walnuts and curious if you’ve tried both. Thanks! Hi Janet, I’ve used both walnuts and pistachios and both are delicious; you can’t really go wrong! I’m planning to make this tonight! I’m curious if you use raw walnuts or if you toast them first? Does it make a difference? Thanks! El, I usually just throw them in raw, but they would be delicious toasted! Would you make any adjustments when omitting the cheese, to boost flavor? I need the pesto to be both gluten and dairy free. Pls cfm, thanks! Hi Kate, while I’ve never used it, I know a lot of people use nutritional yeast in place of cheese in a variety of recipes, so you may want to try that. If not, you may want to add a bit more salt to the pesto as the cheese adds a nice salty flavor. If you were making pesto pasta, would you just pour the room temperature pesto over the hot pasta, or would you heat up the pesto? No need to heat it up, Stacey – I’d pour it over the hot pasta in a pan (with a little bit of the pasta cooking water) and cook a few minutes to blend the flavors. I made it last night and your suggestion worked perfectly!! Thank you so much for the tip. It was delicious! Do you think you could use this pesto sauce recipe over pasta? 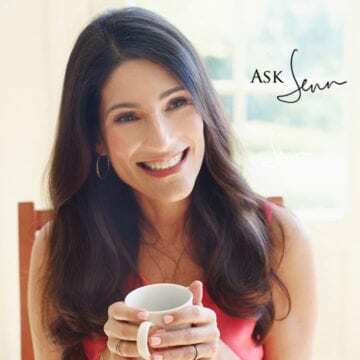 Hi Jen – your recipes are incredible! One question on this, if I wanted to make a “creamy pesto” and add some half and half, would that work here? Hi Haley, I haven’t tried this before, but you could try replacing half the oil with 1/2 & 1/2. I’d love to hear how it turns out if you try it! You can also freeze it… I have and it lasts for at least a year. How much pasta will this recipe dress? Good question Sally– maybe about 1 1/2 pounds of pasta (but it depends upon how “pesto-y” you want it). I’d suggest starting with a pound as any leftovers are also delicious on roasted veggies and potatoes, mixed into soup, or just spread on crackers. What type of walnut? Black oe English?? English walnuts will work best here. Enjoy! Made this last week and it was wonderful! I unfortunately cannot remember how much garlic I put in it and the bulbs that I have now have what I would describe as “huge” cloves. How much would you say a “large” garlic clove coarsely chopped is in teaspoons? Hi Jan, 1 teaspoon of chopped garlic is the equivalent of about 2 average-sized cloves, so I’d just use your judgment based on how strong a garlic flavor you like. Once again my pesto came out incredibly bitter. Inedibly so. What have I done wrong? Followed precisely. Any ideas? Hi Dawn, This definitely shouldn’t taste bitter! Could the cheese have been bad, by any chance? Also, you used walnuts (and not pine nuts)? Mine was also a bit bitter, I’m thinking the basil wasnt as fresh as possible. This is a classic recipe; I came looking for ratios. I ended up making a 20X recipe —- it freezes well! I make a couple additions to this pesto. In the basic amounts there, I would use juice from a 1/2 lemon. This helps emulsify the pesto, and like salad dressings, emulsification is a good thing. Also, I use additional pepper — in this batch, I used 1/3 black (Tellicherry) pepper, 1/3 pink, and 1/3 cubeb berries. If you don’t know what cubeb berries (pepper) are, look it up and get some! You and your guests will appreciate it! I just made this for the first time ever and WOW! Super easy and soooo delish! I actually don’t have a good processor, so I made it in my Bullet and it came out great! I added a couple tablespoons of lemon juice, since the bullet really emulsified it, it seemed to need more liquid. Delish! Thank you for posting this recipe!! Why do I not see the recipe? Hi Rick, I’m sorry you’re having a problem viewing the recipe. Please try this link. This pesto is fabulous! It is the perfect balance of flavors. As usual, I followed your recipe exactly (even S&P amounts) and the results were superb. Lunch was a grilled chicken panini dressed with the pesto; supper is going to be homemade pizza with the pesto spread on the crust. My only hope is there will be enough left for another meal tomorrow! Thanks for yet another go-to recipe that I will be making again and again! I recently started eating pesto and LOVE it! (I might be a little obsessive right now!) I am wondering, could you blend this into sour cream or mayo or cream cheese to make a dip? Sure Mary, I think that would work. If you’re making a dip, I’d go with the sour cream, cream cheese or even Greek yogurt. I’d use the mayo if you plan to use it more as a spread. Would love to know how it turns out! If I’m understanding your question, you’re asking why Parmesan cheese can’t be frozen. It actually can– while it’s best fresh and the taste and texture will be a bit different when you defrost it, you can freeze it. My son and I Made the basil walnut pesto using basil that he grew this summer as part of a Boy Scout merit badge requirement. Made exactly according to your recipe. A lovely Shabbat dinner with wild salmon and pesto fettuccine! Well received by the whole family! Thank you! I just tried to print the recipe and for some reason, it will not print. I just get a blank page. The same thing happened with another recipe from this site. Is something going on with the site? I am able to print from other sites. Hi Vicki, Are you clicking on the print tab? I didn’t see the quantities of the ingredients. How much walnuts etc. Thank you for sharing this recipe using walnuts. I also have Pine Mouth and have found that I can eat Mediterranean pine nuts but not Asian ones. I have to order them, as they are very hard to find in stores. I can’t wait to try your recipe! why did my pesto turn out grainy and not smooth like yours? do i need to process more? Hi Chris, Yes, just keep processing until smooth. Thank you for this recipe. After years of joyfully eating pine nuts I had several bouts of Pine Mouth before I realized the culprit. I find it strange that quite suddenly many people have it. Hopefully it is something to do with the source and we won’t have to swear of pignolas forever. In the meantime walnut pesto will comfort me. For the first time I grew a herb garden and have lots of fresh basil. I used this for your recipe for grilled pesto shrimp and it was really yummy. appreciate you spending some time and energy to put this article together. This is the only recipe I use for pesto. I’ve made it many, many times. Last year I froze enough to last all winter. My basil crop has reached the point this year that I need to start making pesto again. I always reduce the olive oil in this recipe to 1/2 cup (instead of 2/3 cup) for a less oily result. I love to use a dollop of pesto in a quiche or spread a little on sandwiches instead of mayo. Even without the metallic taste condition you describe, the price of pine nuts leaves a bad taste in my mouth. Thanks for the recipe. Made two big batches with my end of season basil; one with walnuts and one with pine nuts. I put the cooled pesto into ice cube trays. After they froze solid, I transferred the cubes into ziploc freezer bags. This makes them super easy to pull out and toss into a pan as needed. Will try today! Looks fantastic. Great idea,had it with pasta and chicken yummm! My local Wegman’s stopped carrying pine nuts in their bulk food aisle because of problems with their supply and cases of pine mouth syndrome being reported. I’m not a fan of walnuts, but I’ve used almonds and pistachios and it worked wonderfully. As Becca mentioned, blanching whatever greens then shocking them in ice water will keep the color vibrant for days in the fridge. Thanks for your discription of how. Living in Phoenix AZ, its mid november, and this could be the last batch of the year. Several lessons have been learned, comments are welcomed. Full sun? This year some of my plants were in the pepper bed getting sun only till noon, they did better in the heavy heat, so I made them all morning sun only, until the temps dropped. I add hot peppers, and add sugar to balance the bitterness. Also use a variety of basils, including Thai, Greek, Lemon, and several varieties of Sweet. My freezer is full of pesto cubes. Being end of seaon, this time I will separate varieties. Tried it since I love so many of your recipes, but must confess… I prefer using pine nuts to walnuts. Love to eat the pesta tossed with orzo… great, fast & easy side! Everyone should know about this tip. If you don’t plan to use all your pesto quickly, i.e. freezing it, blanching the basil leaves for about 30 seconds in boiling water will keep the pesto a vibrant green color. Before blending the pesto ingredients, blanch the basil leaves, take them out of the boiling water and run them under cool water to stop the cooking and then add to the food processor as the recipe directs. This really works and keeps pesto a nice fresh green color, even after freezing and defrosting. I never liked pesto, but this recipe has changed my mind. Even my boys will eat it over pasta. Wonderful recipe–thank you!! Pesto is one of my wife’s favorite flavors. This came out fantastic. We can’t wait to use it on different foods. This turned out great, thank you for sharing. Walnuts are a great sub. for pignoli. I’m going to have to try this!! a great idea. i never thought to sub walnuts for pignola nuts. Walnuts were a great sub for pine nuts. Heading out to plant my basil seeds right now, with this dish as an inspiration! Loved serving this, as you suggested, drizzled over the summer vegetable soup. This looks good. This is one of my favorite thing. I love this! This is very easy to make and a great. How to make the perfect basil pesto? Hi, Just made your walnut pesto! Delicious. Really am going to enjoy this with veggies or pasta…can’t decide which. Just got a bunch of purple basil from our CSA and wasn’t sure what to do with it so figured I would give this a try. Thanks! I also grow herbs and my basil was gorgeous this year! (live in Atlanta, GA) I have made about 5 quarts of pesto so far this summer. I also use walnuts instead of pine nuts, but it is mainly due to the difference in COST. A similar recipe was on The Barefoot Contessa on Food TV…so cheers to you and thanks for sharing! I read that the problem with pine nuts was from the pine nuts from China, not the USA. You’ve got to be careful! And walnuts are much cheaper than pine nuts anyway. Thanks for the recipe. This looks good. My husband loves walnuts. I’m still using pesto I froze last summer. I’ve never heard of pine mouth syndrome. It sounds awful. I do check to see where the pine nuts I purchase are from. We have some in our grocery that are from a local area in Texas. I checked one of the popular Italian brands and they are actually from China, which surprised me.